Hey guys! I know its been awhile but I was rushed to Urgent Care last Wednesday and have been on bed rest since. I am still feeling very much under the weather but wanted to make sure I was able to swatch and post all polishes that were sent to me, as I felt it was my obligation to make sure they got done, this meant I spent all last Sunday and Monday swatching while in bed, lol. It was hard but I got it done! I am sad though that I am missing an entire week of Digit-al Dozen prompts, very sad face!!! 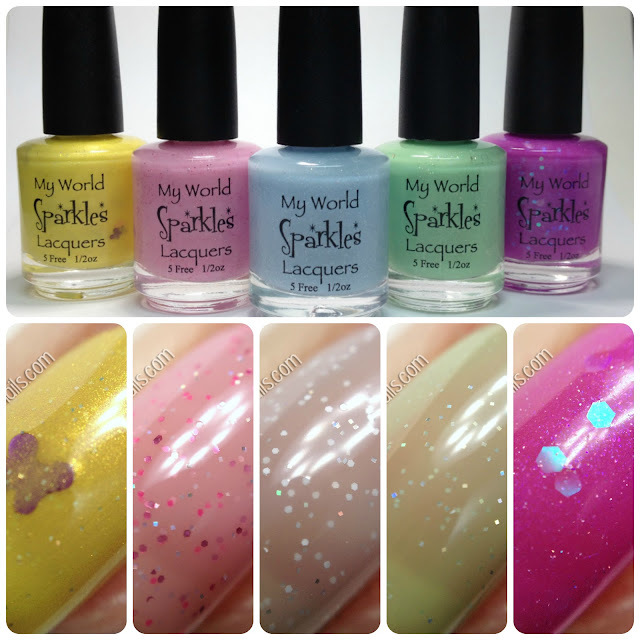 Anyways, Today I would like you to meet the Kisses Collection by My World Sparkles! This collection consist of 5 spring colored polishes. 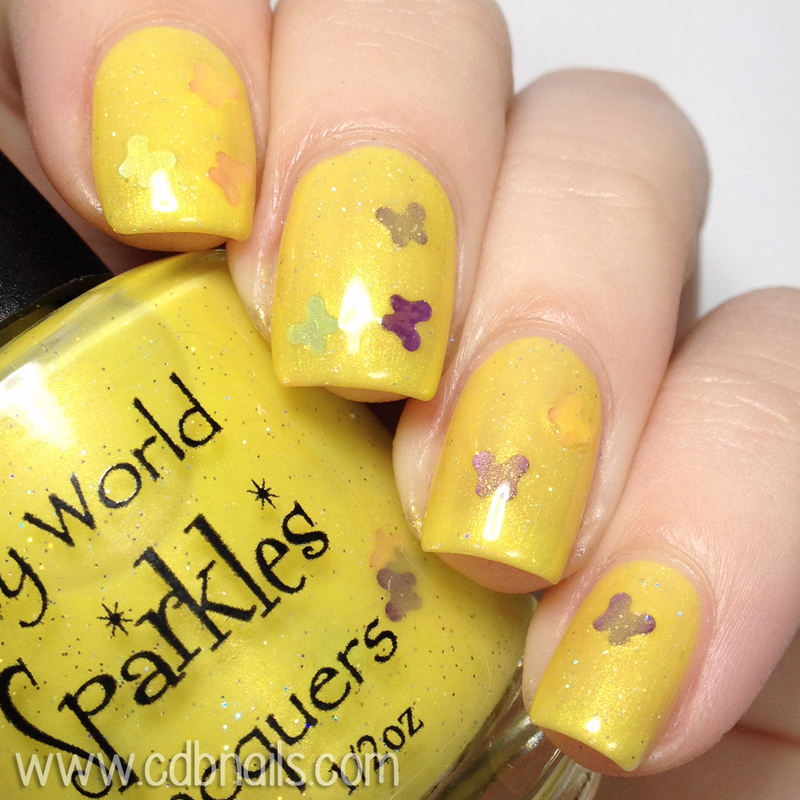 Butterfly Kisses is described as a vibrant shimmery yellow color with various butterfly glitters. I applied two coats to achieve full opacity and sealed it with a glossy top coat. Formula was good and applied well but I did have to do a good amount of fishing and placement for the butterfly glitters. I mentioned this to Elizabeth and she said she will be adding more butterflies to the polishes for release. Heavenly Kisses is described as a orchid crelly color with a multitude of iridescent glitters. I applied three thin coats to achieve full opacity and sealed it with a glossy top coat. Formula was good and applied well. Eskimo Kisses is described as a soft sheer ice blue with white and sparkly glitters. I applied three thin coats and sealed it with a glossy top coat. This is a very sheer polish but applied well and the glitters dispersed nicely. Puppy Kisses is described as a soft sheer mint green with holographic micro glitters. I applied three thin coats and sealed it with a glossy top coat. 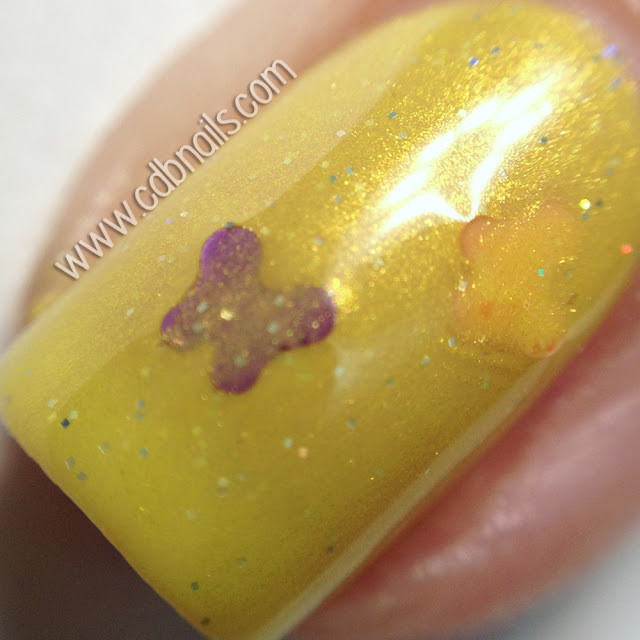 The formula on this one was a little thicker and i felt like it didn't level out as well as the other sheer polishes. I was left with some patchiness. I mentioned this to Elizabeth and she said it seems to be laying differently on each blogger. Sweet Kisses is described as a soft sheer pink with various holographic and pink micro glitters. I applied three thin coats and sealed it with a glossy top coat. Formula was good and applied well. Out of the 3 sheer polishes this was my personal favorite application wise. Overall, They are all great spring colors and the kisses theme is rather cute. I'm personally not a huge fan of sheer polishes but that's because I have serious staining on my nails which you can see under sheer polishes lol but to each their own! The Butterfly kisses and Heavenly Kisses were opaque enough for me and I enjoyed them. My personal favorite from the collection is Heavenly Kisses. This collection is available for pre-order now at the discounted price of $35 or $8 individually. Also use my code CDB10 to receive 10% off your order! Also Subscribe to their newsletter to be kept up to date on all things My world Sparkles!